The following feature ran on Sports On Earth in April 2016. The site was shuttered earlier this year. 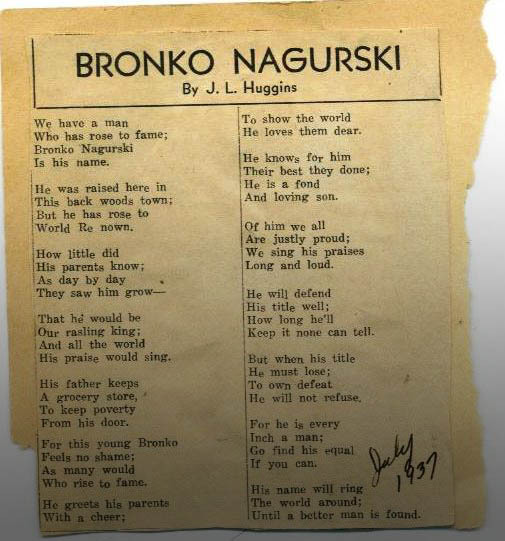 Bronko Nagurski’s backstory reads like a Paul Bunyan tale. One of the most celebrated athletes in American history, he made an indelible impression on collegiate and professional football as a two-way standout for the Minnesota Golden Gophers, and later, Chicago Bears. University of Minnesota associate athletic communications director Paul Rovnak shared the following thoughts from Grantland Rice, the iconic sportswriter whose prose contributed to college football’s growing popularity in the first half of the 20th century. “In my book there is only one when it comes to the best all-around player … Bronko Nagurski of Minnesota. A standout and All-American at both fullback and end, Nagurski’s ability was transcendent — and not limited to football. Think of his performance in modern terms. Take Derrick Henry, former Alabama running back and 2015 Heisman Trophy winner; add former Temple linebacker Tyler Matakevich, named college football’s premier defensive player in the past season. Not coincidentally, the award Matakevich won bears Nagurski’s name. Now, throw in Roman Reigns, currently one of professional wrestling’s top stars. You’ve got Bronko Nagurski. Nagurski blazed as much of a trail in the squared circle as he did on the gridiron, one that is still very much evident today. Professional wrestling and college football share a rich, historical connection. For example, Reigns – who faces Triple H Sunday at WWE’s flagship event, WrestleMania – won All-ACC honors as a defensive tackle at Georgia Tech in 2006. The night before the 32nd edition of WrestleMania, WWE will induct Stan Hansen into its Hall of Fame. Hansen became one of the most celebrated gaijin, or foreigners, in Japanese wrestling, employing the same smash-mouth techniques used as the lineman for West Texas A&M (formerly West Texas State). From Reigns and Hansen, “Stone Cold” Steve Austin (North Texas) and Dwayne “The Rock” Johnson (Miami), Tully Blanchard and Terry Funk (West Texas A&M), football’s roots in wrestling run deep – and the lineage starts with Nagurski. He began wrestling professionally during his days in the early NFL, moonlighting in the ring during the offseason to supplement his income during the Great Depression. J.L. Huggins duplicated the level of praise Rice lavished on Nagurski’s football skills in a 1937 poem about the two-sport star’s wrestling accomplishments. His name will ring/The World around/Until a better man is found. The world may still be searching, based on at least one criteria. Nagurski’s induction into the College Football, Pro Football and George Tragos/Lou Thesz Professional Wrestling Hall of Fame makes him a rarity among two-sport stars. Even the most notable, crossover performers are not often enshrined at the highest level in each of their chosen endeavors. Now, using the terminology “two-sport” might raise some eyebrows for those unfamiliar with the history. Despite the athleticism necessary to perform, modern-day wrestling is known more for theatrics than for athletics; more spectacle than sport. However, Nagurski stepped between the ropes in an era when professional wrestling served as a showcase for strength, agility, grappling ability – a true athletic endeavor with an entertainment twist. Perhaps nowhere is this more evident than in his rivalry with arguably the Father of Professional Wrestling, the man whose name graces the Professional Wrestling Hall of Fame, Lou Thesz. A reported 9,000 packed into the Coliseum on a June day in 1939 to witness Nagurski claim the National Wrestling Association heavyweight championship – a belt directly tied to the most prominent wrestling title of today. Later incarnations of the National Wrestling Alliance traced its history to version of the NWA title Nagurski held. It later became the “Big Gold Belt,” which another former Minnesota Golden Gopher footballer, Ric Flair, defended for much of the 1980s. The title Flair famously carried became the top prize of World Championship Wrestling. WWE owner Vince McMahon’s purchase of WCW in 2001 brought the former NWA title under his company’s umbrella. It was defended in WWE from 2002, until merging with the current WWE World Heavyweight Championship in 2013. When Reigns and Triple H grapple before a projected 80,000 in Arlington, Texas’ AT&T Stadium, they’ll owe a debt of gratitude to Nagurski and Thesz and that match some 250 miles and 77 years away in Sam Houston Coliseum. Regardless if you see Nagurski as “arguably the greatest collegiate football ever to play the game,” as Rovnak described, or as one of wrestling’s first true stars, Nagurski’s legacy looms as large now as it did decades ago.